Altra Federal Credit Union proudly presents the beloved children’s classic CHARLOTTE’S WEB at the Roxy Regional Theatre for six performances, beginning Friday, January 25, at 6:00pm. In keeping with the theatre’s traditional pay-what-you-can opening night, all tickets not pre-sold at the regular ticket price will go on sale at 5:30pm that evening for a $5 minimum donation. Named “the best American children’s book of the past two hundred years” by the Children’s Literature Association, E.B. White’s classic tale comes to life upon the stage of Clarksville’s oldest professional theatre. All the enchanting characters are here: Wilbur, the irresistible young pig who desperately wants to avoid the butcher; Fern, a girl who understands what animals say to each other; Templeton, the gluttonous rat who can occasionally be talked into a good deed; the Zuckerman family; the Arables; and, most of all, the extraordinary spider, Charlotte, who shows the true meaning of a friend by setting out on a mission to save Wilbur’s life, even if it means the end of her own. Starring Matt Flocco as Wilbur, Emma Jordan as Charlotte, Kylan Elizabeth Ritchie as Fern and Bryan Plummer as Templeton, CHARLOTTE’S WEB also features Brian Best and Brooke Leigh Davis as John and Martha Arable, David Graham and Alexandra West as Homer and Edith Zuckerman, Ian Alexander Erbe as Lurvy and Avery Arable, and Theresa Graham as a Gander. 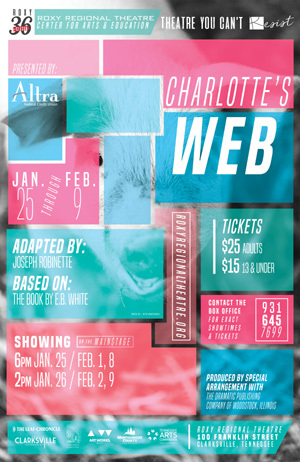 Directed by Ryan Bowie, CHARLOTTE’S WEB is adapted by Joseph Robinette from the book by E.B. White, and is presented by special arrangement with The Dramatic Publishing Company of Woodstock, Illinois. In addition to Altra Federal Credit Union, funding support for CHARLOTTE’S WEB has been provided by Jim B. Marshall and Randy & Su Whetsell. Tickets are $25 (adults) and $15 (ages 13 and under) and may be reserved online via the below button, by phone at (931) 645-7699, or at the theatre during regular box office hours (9:00am to 2:00pm, Monday through Friday, and one hour prior to curtain). In the absence of weekday performances, APSU students, military and CitySaver coupon holders can receive two tickets for the price of one to Friday performances during the run.